If I had to draw a brewery hot spot map of the U.S., it would glow red around Chicago; it would burn with fiery hues in a stretch from San Diego up through California, and the top left, Portland, up into Washington State would light up the rainy night sky with its incandescence. And of course, for fear of upsetting anyone Stateside, it would be peppered with spots of orange and red just like the holes surrounding my dartboard; peppered from Alaska, Hawaii and right across to the Atlantic seaboard. Except for Florida. What Florida is known for is a state that grows citrus fruit (somewhat erroneously, it’s predominantly a cattle grazing State nowadays), welcomes Canadians for their Winter hibernation, has a world class theme park in a swamp, a rocket base and has an incredible coastline with an enceinte of beautiful Keys, home to Manatee, ‘gaters, everglades and the Lesser Spotted Key Lime Pie. But beer? No, non, ni. Why? Why did I believe this? And why have I changed my view? Well, just a few short years ago, I combined a business trip with a holiday to the state. The craft beer range in the supermarkets were slight; internet search engines for ‘Craft beer Florida’ or ‘Florida microbrewers’ broadly drew a blank. 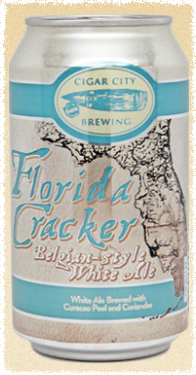 It seemed that The Sunshine State was still in love with sunshine lagers designed for hydration and slaking thirsts, not offering character or uniqueness. On my particular travels, I found one brewpub, located in a characterful building, but on checking it a few years later, found it was closed. The first difference: the snack and drinks trucks around the Disney Parks. Yes, they’re still selling plastic beakers of Bud Light. But they’re also selling Sam Adams Summer Ale. Think what you like about Jim Koch, but that feels like a mighty beachhead to me. And then there’s the selection of craft beers in C stores and supermarkets, which I wrote about in a recent post – you can’t miss it. Craft beer is reaching maturity too – or at least it’s now a dominant trend you can’t ignore rather than something that’s emerging. People are getting excited and on board. And more particularly, Floridians are getting excited and on board. And so it came to pass then that we ended up in a friend’s swimming pool, cooling down after a day kayaking drinking cans of Cigar City Brewing’s Florida Cracker. I liked this beer very much: it was a Belgian style ale, brewed in the American way; some unmalted wheat, curacao orange peel, coriander and according to their web page, a Saison yeast. It was a blissful combination after a hot day; characterful yet refreshing; reasonable pokey in alcohol (5.5%ABV) yet hopelessly drinkable. The brewery was in nearby Tampa and from the range that I saw, and the fact that the locals I spoke to knew of it, bodes well. Just to the south of Tampa is circus country; Sarasota is where The Ringling Brothers circus had their base, provenance which lends its inspiration to Big Top Brewing Company and many of their brands. I got some Circus City IPA – a feisty, hop-forward beer. And again, in cans – this time packaged on a mobile canning line; the can being stickered (nicely done) rather than printed – an additional help to the would-be brewer. There are more: I liked the look of Fat Point in Fort Myers too but couldn’t make it down there; further south there’s a brewery on the beach in Naples. In fact, poking the wasps’ nest found me stumbling upon the site of the Florida Brewer’s Guild. Take a look. Little breweries popping up everywhere. Soon the map of Florida will be painted red. *Other music providers are available. Oh, and it’s from ‘Foxtrot’, 1973.